It’s pretty easy to find zines in your local independent bookstore or record shop. But there are lots of other places that I never knew about to get zines, and I’d like to share this one with everybody. Pygmy Hippo Shoppe (PHS) is a go-to for gifts and beautiful art that you can actually afford, but I didn’t know that they had such a great zine section until I did this interview with PHS’s owner. This interview originally appeared in the LAZF Guide To L.A. #2 and wouldn’t have been possible without Marie Lodi of Agent Lover. Thanks to LIsa Kannakko, whose photos are used in this post. PHS has a really great Twitter and Instagram persona, with frequent appearances by animals. 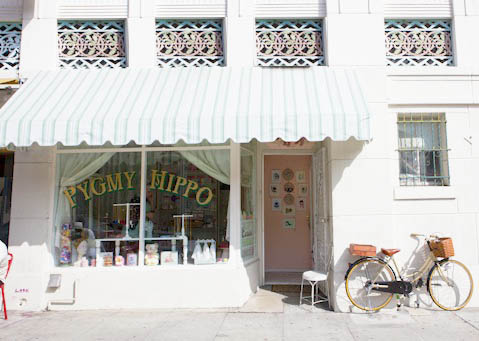 The Pygmy Hippo Shoppe is the creation of Emi Avanessian, and she answered a few questions about how the Pygmy got its start, the best part of owning your own pygmy business, and why she’ll always carry zines. LAZF: How did you end up in L.A.? Emi: I’m from here, born and raised in East Hollywood! There was a period in my late teens where I wanted to move to the East Coast, but once I started traveling a bit I realized that while I really love to visit other cities, there is nowhere else in the US that I’d rather live in than Los Angeles. I think we have the perfect balance of everything here and I love every inch of my city! LAZF: Where did the idea to start PHS come from? Emi: I spent all of my teens and early 20s working for tiny companies that were often run by one or two people max, so I always knew that working for myself could be an option. I seriously had great luck landing jobs working for really creative, amazing women who taught me to do everything from silk screening to bookkeeping and everything in between, so I understood quickly that if you keep it small and wear all the hats, you can make it happen (and you can make it happen without TONS of money–this is important!) After the economy took a dive, I had to press pause on my jewelry line, which I’d been running since 2003, and I didn’t really know what I was going to do. …The idea of having a store had been in the back of my mind for quite some time. To have a place that I could stock with my own work, with my friends’ work and all of the other artists and independent brands that I’ve been a fan of was always something I’d dreamed about doing, but the reality of what it would cost to build it, fill it and, on top of that, pay rent was way out of my league. One day when I was walking down the street to my local coffee shop, I noticed this tiny store front with a For Rent sign. I didn’t even understand what I was looking at because it was so small and the window was always curtained off, so I’d never noticed the actual size of the space before! I went home and immediately told my boyfriend Nathan that I found a little dream space and that I wanted to open something that looked like it came off of Main Street Disneyland. I really believed we could turn it into something special and he loved my ideas, so the two of us got started right then and there. We drew everything out and busted our asses for three months, building out the entire store together from the ground up–building and painting all the shelves, laying down the floor, and even putting up the wallpaper. Nathan is so talented and inspiring, even though he isn’t in here every day like I am, he plays a big part in the Shoppe and has painted all of the signage and created all of the logos. At the risk of sounding super corny, it was all just meant to be. The rent is affordable, I live in the neighborhood so I can ride my bike to work, it’s small enough that I can run it by myself, and I was finally able to call up all my friends and tell them to send me all of their work! LAZF: What’s the best part about being the owner of PHS? Emi: Meeting all my customers face to face is the best. That’s something I never experienced when I ran my jewelry line because I was working out of my home and I literally just talked to my retailers, my dogs and Nathan. Getting to know everyone who shops here on a personal level and hanging out with their dogs and talking to their siblings and kids, and their parents–I don’t know, it’s pretty amazing. It’s such a small space and such a niche audience, it’s impossible not to form close relationships with everyone. Sometimes customers are shocked that I remember them, but I’m like, are you kidding? We spent an hour talking about your dog’s knee surgery and I cried like a freak, or like, you came here to find a gift for your daughter’s Bat Mitzvah–you think I can forget this stuff?! LAZF: I heard you’re a big supporter of zines and I know that some of the artists whose work you sell in the Shoppe you met at the Zine Fest. Why do you think it’s important to have zines in your store? Emi: Yessssss! The general idea behind Pygmy Hippo Shoppe is to have a place where people can find things that they hopefully won’t see in every other store, so that idea combined with the idea that I could support all these artists I love who are making zines was just a no brainer. I grew up reading and making zines too, and I love the idea that people can walk to the corner of their street and pick up a new zine whenever they want to because I would have KILLED for that experience, you know? There are a couple of really young kids in the neighborhood who save their allowance and come in with their parents to buy a different zine every other month and it’s so cute and exciting for them. I’ve also realized that there are so many people who don’t know what zines are (I’m talking about my peers too! ), so it’s been nice introducing the medium to new people, especially in this neighborhood. 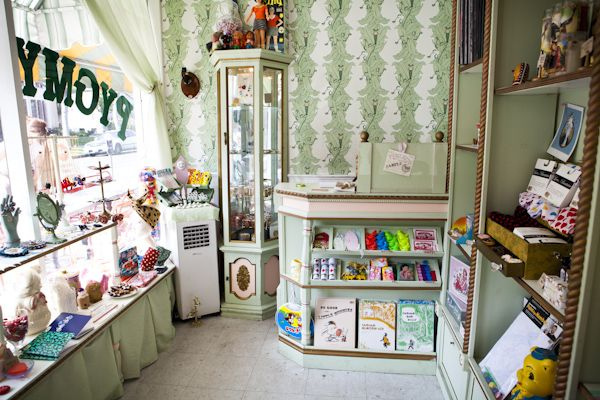 The Pygmy Hippo Shoppe is located at 306 N. Stanley Ave., east of Fairfax and Beverly. They celebrated their two-year anniversary in December 2012. < BorderComics 2013 in Tijuana!